Can I sponsor Revive Adserver? This new release fixes a number of bugs that were discovered since the release of Revive Adserver v4.1.1 on October 24, 2017, and it has a small improvement for the HTML5 banner functionality introduced with v4.1 in October 2017. We are delighted to be able to announce that we have now reached our $500/month goal, and are only $173/month away from our $1000/month goal. This new release fixes a number of bugs: Users trying to upgrade their installations reported problems when they initially installed the software before v2.8.x. These problems have now been fixed. Systems that were initially installed with v3.0 or higher, were not affected. We also fixed a small but annoying issue on the Campaign Properties screen when editing an existing campaign. Revive Adserver v4.1 is available now. This version contains several enhancements and improvements, and some bug fixes. The most important enhancements are: support for HTML5 ads (beta), new delivery rules for whitelisting and blacklisting domains, and a WYSIWYG editor for HTML banners. The Revive Adserver team announces Release Candidate 2 of Revive Adserver v4.1, containing bug fixes and one new feature. Revive Adserver is also available as a Hosted edition, with costs as low as $10 per month. 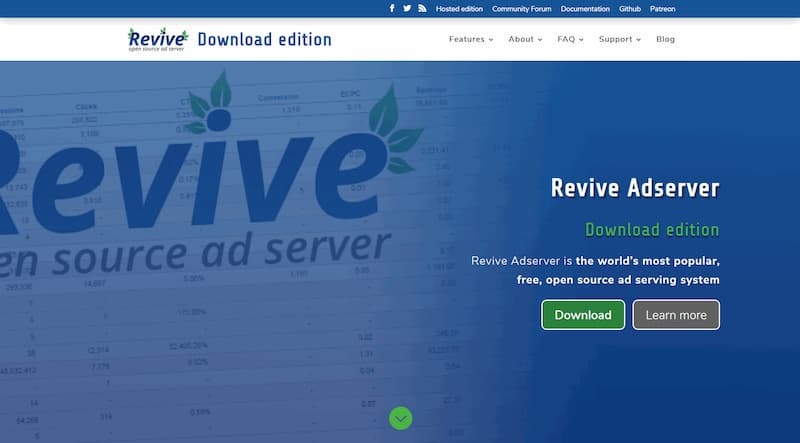 Revive Adserver is a project by Revive Software and Services. The hosting of this website is kindly provided by Aqua Platform, specialists in next generation cloud based Revive Adserver Hosting, systems and technology. We also have other sponsors. You can also be a sponsor, by contributing to our project on Patreon. Even just $10 per month will help.